You are here: Home / Halloween / Steampunk Make Up Tutorial – Airship Pirate! 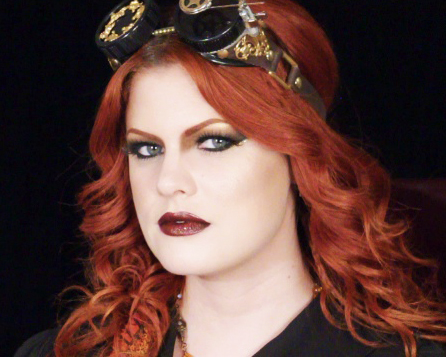 Steampunk Make Up Tutorial – Airship Pirate! I am very excited to be collaborating with Siobhan of LetzMakeup again and to kick start our Subculture Series after a nearly two year hiatus. We both decided that there was a severe lack of alternative make up resources on the internet and that’s what initially motivated us to create the series in the first place. I went back and forth in my mind about what kind of look I wanted to create and I was feeling overwhelmed by how broad the steampunk aesthetic can be. The steampunk genre means different things to many different people, so I decided to draw upon the gold and brown color scheme of the commonly seen gears and rustic technology prevalent in steampunk imagery, while still implementing the black eye shadow as an ode to the classic pirate look. I hoped to infuse a sense of fantasy and retro-futuristic styling into my design so that it stood out as something more ornate than just your conventional brown and black smokey eye. After much discussion with my boyfriend, we decided it was easier to create a character of sorts and expand on my design options from there. Initially, my idea behind the lips was to mimic a sort of wine stained effect. In the tutorial, I show you how to achieve this look and eventually end it by applying the same dark wine color to my entire mouth to provide a little diversity for all of you looking to use this make up for cosplay or even Halloween. I enjoyed exploring the realm of steampunk, as it has been a long time favorite subculture of mine. 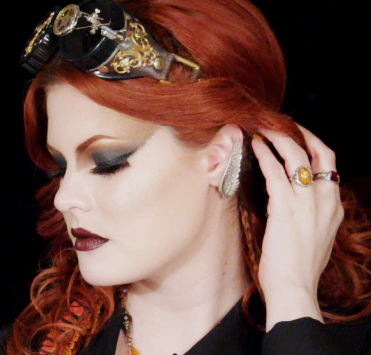 I hope to do a few more looks in the future, so stay tuned for that and in the mean time, check out LetzMakeup’s take on the steampunk aesthetic.